Cabinet facings can be made with a variety of compound materials that provide flexibility in color, design and styling, providing another great option for many homes. Here are some types of compound materials to consider when choosing cabinets. Detailing options for PureStyle laminate are endless because of continuous component wrap technology which eliminates the potential for de-lamination, peeling or cracking. Extensive testing has demonstrated PureStyle’s resistance to UV light, aging, moisture, heat damage and staining. Thermofoil is a process where heat and pressure are used to bond a thin layer of PVC (Polyvinyl Chloride) film to a shaped and glued component made from MDF (medium density fiberboard). 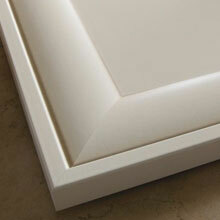 The result is a seamless surface that covers a panel's face and edges. 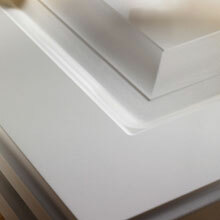 The component back uses a white, seamless melamine surface - excellent for easy cleaning.